Hanson came to us for a new website, their previous site having launched sometime around 1971 (not really). The client needed their site to be mobile responsive and include improved SEO in order to better square off against their competitors. We were also tasked with designing an email newsletter template and revamping the design of their social media pages. Even the most old school of industrial businesses has the opportunity to provide comprehensive, easily navigable online experiences for their customers. Our approach was to streamline the process of sifting through their hundreds of products and to upgrade their mobile experience. We also added modern photography to the site’s main pages and reduced the number of options on the main navigation to help customers find what they’re looking for quickly. This cleaner, more accessible look was then carried over to the client’s email newsletter and social pages. 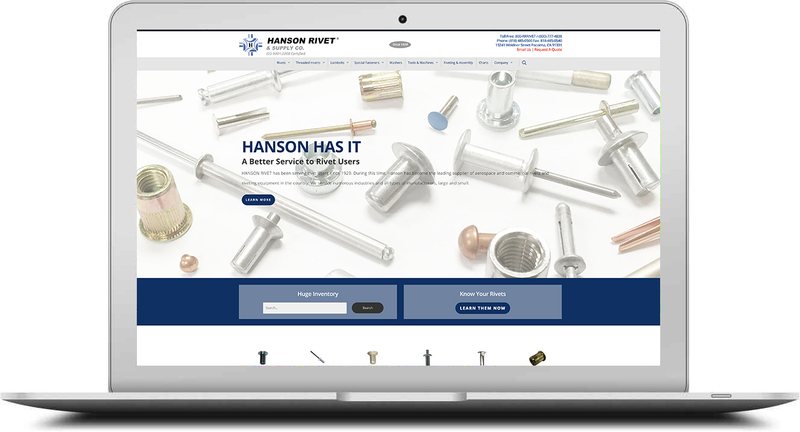 The brand-new hansonrivet.com is sleeker and easier to navigate than even the client thought was possible. Our SEO work immediately increased the client’s website sessions by 15% and the number of unique users by 16%.